Lower carbs by using a cheesy cauliflower topping. Shepherd's Pie: heat the olive oil in a large saucepan and fry the onion and garlic until cooked, but not browned. Add the mince and stir until it is all cooked and browned. Add the tomato paste and carrots. Mix. Reduce the heat to a simmer. Simmer uncovered for 10 minutes while making the cauliflower topping. Let the liquid evaporate so the mince thickens. When finished simmering add peas. Cauliflower Topping: boil the cauliflower until soft, this takes about 8-10 minutes. Drain and allow ALL the steam to escape. Too much water left in the saucepan will make a 'sloppy' mash. Add the butter, cream and salt and pepper to taste. Using a stick blender with a blade attachment, puree until smooth. To Assemble: place the shepherd's pie mince/ground meat mix in the bottom of a large casserole dish. Top with the cauliflower mash then sprinkle on the cheese. Put the casserole dish on a baking try to catch any liquid that may bubble over. Bake at 180 °C for 20 minutes and until the cheese is browned. Use layered in lasagna or tossed with hot pasta. 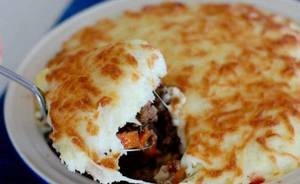 There are 399 calories in 1 serving of Low Carb Shepherd's Pie. Calorie Breakdown: 66% fat, 7% carbs, 27% prot.